Photo thanks to SuperheatedSteam of Reddit. In my attempt to see if any of the major USA retailers are selling exclusive store blasters, I figured I’d gather up all the online listings I could find. Also since we don’t really have a name for these batch of blasters, mags, and darts that just got released, I’ll just be sticking them in the “2012–2013 Winter release” category for now. The Strongarm and Firestrike are also being sold at Target. In Southern California, my friends have told me that they’ve seen the Strongarm and Triad for sale. I’ve also seen the Diatron for sale in Toys R Us. I’ve also seen the Firefly Mission Kit and “Elite Glow Darts” being sold. Out of the new items, I’ve only managed to see the Firestrike so far at Walmart. 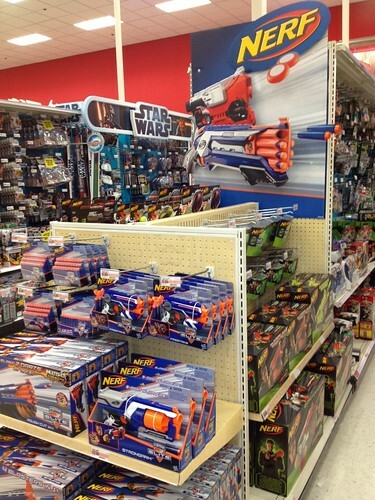 Have you heard about the new Super Soakers of 2013 on Nerf’s Website. All the information is on my blog if you want to use it. Well, when I made the post and comparison, I was doing the comparison between these 4 major retailers. Hey, its SuperheatedSteam on Reddit. I really don’t mind people using my photos, but could you at the very least tell me before doing so? These images were not copyrighted or anything, so it makes no difference, but when I see this in a community, it makes me think twice whether I should continue submitting content for a community that doesn’t like to give credit where credit is due. Apologies for that. I usually do give credit for images and finds and such, you can check my past post history for that. I was multi-tasking when making this post, and I usually forget things when I do that. I’ll change the post and give credit, thanks for taking the photo.